The first single Elvis ever released was “That’s All Right,” a sped up, stripped down cover of a blues song. Elvis began playing the song as it’s now known while goofing off during a break after spending hours trying to record something that pleased Sun Studio head, Sam Phillips. Finally, Phillips heard something he felt would do well on radio and produced the record. 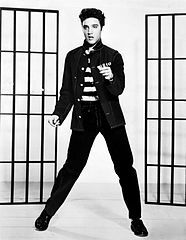 The single’s radio release would mark the start of Elvis’ musical career, leading to a recording contract a year later. The Lesson: You can’t force a viral sensation but, with experience, you’ll know when you’ve created good content. Elvis first publicly performed “Heartbreak Hotel” in December 1955 and officially released the single in January 1956. While the song is remembered as a hit, it did not become popular right away. The song only rose up the charts after Elvis performed it during his first nationally televised performance on March 1956. The Lesson: Sometimes the channel you post content to won’t bring the desired results – try different platforms and don’t be afraid to go big. It was during his second appearance on the Milton Berle Show that Elvis would court controversy with a now famous performance of “Hound Dog.” Elvis’ young fans went wild for the performance while older, more conservative audiences denounced him as “Elvis the Pelvis.” Despite much negative criticism, Elvis refused to apologize for his style of music and dance. His fans rewarded him by keeping “Hound Dog” at the top of the charts for 11 weeks. The Lesson: Stay true to your brand and your supporters will reward you with their loyalty (and possibly more). Before taking up music, Elvis expressed an interest in acting. He had a natural talent and was cast in his first film role, “The Reno Brothers” in 1956. During a break from filming, he performed “Love Me Tender,” a song from the film, on The Ed Sullivan Show. The song immediately went to the top of the charts whereupon the film’s producers decided to capitalize on its popularity by renaming the film after the song. The title change proved a winning strategy, leading to success at the box office. The Lesson: Capitalize on your strengths and what makes you recognizable to fans when launching new campaigns or projects.